Mouraria is one of Lisbon's oldest districts. It's located on the foothills of the castle and it's now the most multicultural area in town. What a wonderful street shot. Those steps would be hard to navigate for some of us older folks, though. Looks like a quaint and most interesting area. I'm finding your title to be very true. I love this photo. It speaks volumes. Ah, with my knees I would not do well with all those stairs even if they are beautiful!! Great pic for the day, Jose, as always! Hope you're getting ready for a lovely December weekend!! Enjoy!! The ups and downs of daily life. That can be a tough climb. Those stairs will keep her fit, JM! Great streetscene! Brave old woman. When we visit cities with hilly areas - Montmartre in Paris, Jilly's Gorbio, Edinburgh, San Francisco - I sometimes wonder about the lives of the elderly and those with medical impairments. Do they struggle in pain or become shut-ins? This woman is not about to give up. I wonder how these old people can step up all these stairs you have there..
Looks like a long way up! I'm glad she has a cane and a railing to help her. 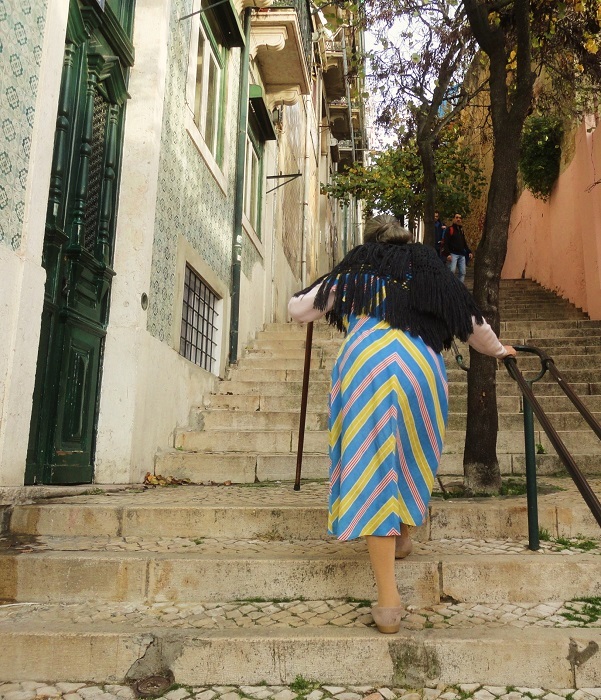 I have been watching documentaries of various European destinations and have notices the steep streets with steps … was wondering how it is for older folk. When in Europe, I have been struck at the way very old men and women are able to walk up or down very steep steps. I guess it is because they have done so for decades.